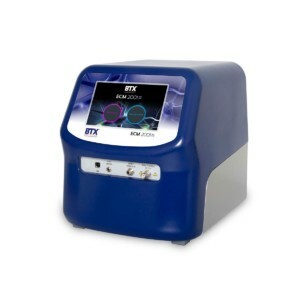 Powerful multi-purpose system providing fast, efficient cell fusion in hybridoma production, hybrid cell formation and nuclear transfer applications, as well as square wave electroporation for transfecting genes and other molecules into mammalian cell lines. For use in small volume cell fusion applications such as embryo manipulation, we recommend the ECM 2001+ Embryo Manipulation System (452047). Utilizing the ECM 2001+ System Complete, for Cuvettes (452046) for standard mammalian cell transfections is simple. The AC feature is turned off and the DC mode is set as a square wave electroporation device. The range of voltages and pulse lengths that can be programmed, coupled with the ability to carry out up to 10 pulses per experiment, make this an extremely versatile system for any lab.